If you are on the fence, get off and come on down. Geoff Dunaway is getting Friday dinner ready with some help! You're making me hungry here Jeff. That looks good. Arrived in Harrison just before midnight after a 7 hour drive. Looking forward to my first fan event! Would you buy a used car from any of these guys?? 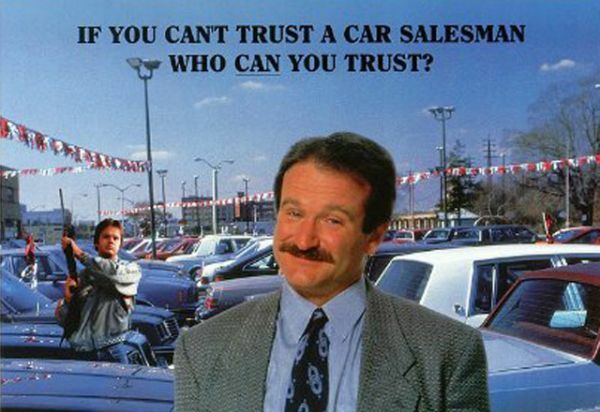 Would you buy a used car from any of these guys? The weather turned cool but the fellowship was warm. This group is so supportive and knowledgeable. For allowing us to spend time at their wonderful place. I feel so blessed to be included in this group. The Royola ... The third one produced by Bobby Roy from Ola. Jim Kovar rebuilds a Variac. Trial by fire: Rod Rogers, left, and Paul Graves repair a lollipop strut. How about a picture of Dexter. Lucas Beshara, right, adds new rivets to an Emerson under the watchful eye of Tom Newcity, center, while Kevin Clarke observes. Tom demonstrated how to re-rivet blades during the Old Fan Workshop. Will any instructional videos be posted? 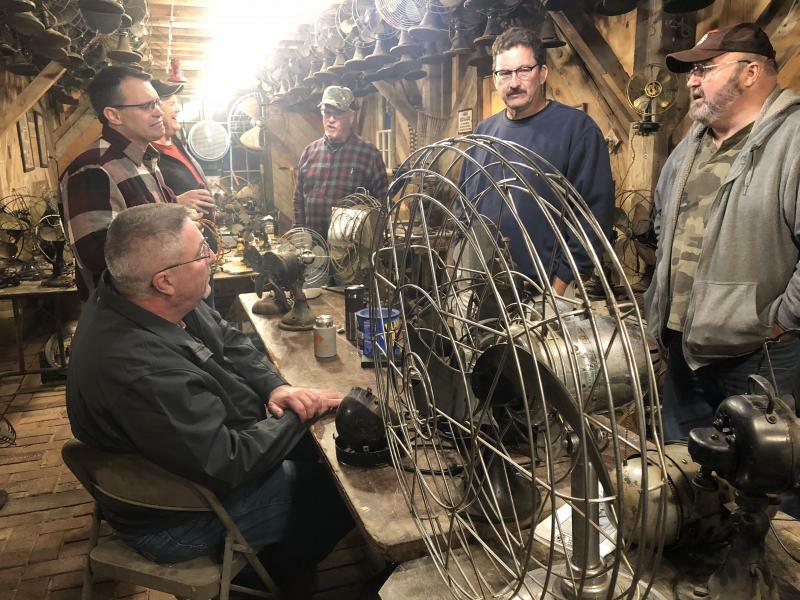 The "new" fan barn, complete with more tables, where folks showed their fans, storage space for "hanging" Emersons and ... a spot for George Durbin's special fan. George brought his jewel, a Greco-Roman Emerson for a rare public viewing. Security was tight. Wilene Rigsby set up shop in the "new" fan barn. She and Kelly Rigsby brought several fans to sell. This was my first meet and I really enjoyed it. It was good to put faces on several people who have helped me over the years and to meet some of the fan club members. It was especially great to meet Kelly and Wilene Rigsby who I shared table space with and I enjoyed every minute of it. They are some of the nicest people I have ever met!! *Thanks to George Durbin for repairing my Barcol fan cage. Doc, thanks for all of the great food and hospitality. Gary Kueffer, left, and Stephen Chew in the new fan barn. This circulator underwent strategic reviewr and ran as smooth as silk by the end of the fan meet. Anyone care to guess the brand? Thnx. Jeff for the wonderful pictures and bringing yur pop along! James Henderson wrote: How about a picture of Dexter. Absolutely James. What would a Harrison fan meet be without Dexter? And there is now Sparky and he is fast learner. Jeff Whitfield wrote: The Royola ... The third one produced by Bobby Roy from Ola. The name of this fan sounds like the name of a Juke Box or an old Radio from the 1940s. Page processed in 0.2939 seconds (31% database + 69% PHP). 34 queries executed.